Today I wish to blow my own trumpet. I think that I should drawn attention, if only my own, to the extreme effort and monumental show of self-discipline on display at the Windswept Acre. August may be over today but my UFO-busting efforts will continue because I am determined to see these socks completed now. “These” socks are the Herringbone Rib socks from Knitting Socks with Handpainted Yarn , and socks that I have been knitting since April 2009. I managed to knit four and a half inches of the first leg when I started them. The slowness of the rib pattern drove me bonkers. I hated every moment that I spent on the damn thing. Eventually I officially hibernated them — and hoped that one day I would develop a better relationship with them. …and then left them alone until last Tuesday, when I decided that Something Must Be Done. And done it was! At least, one sock was. I finished it on Friday. 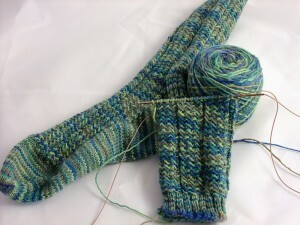 The post-heel section went so much better, with only half the foot stitches to be done in herringbone rib. It was not clear to me whether the socks were going back into hibernation as the end of my UFO-bashing month loomed closely, or whether I would beat Second Sock Syndrome and cast on. The cast-on happened on Sunday. I was still unsure what would happen. The temptation to ditch them was huge. Clearly they could not be completed before the month end… was there any point in even starting them? Well, I knitted onwards yesterday — until at bedtime I had about 4″ of leg. There could have been more, but I spent hours looking for patterns for my new yarn stash. It was displacement, really — I would rather do anything than shuffle all those stitches around… it is monumentally boring. The temptation to begin something new was enormous. In the end, I felt discipline take hold. I shall finish these socks. I now know that once I pass the ankle, they will speed up enormously. The end is in sight. It truly is. I can make it. I will make it. I will not start that Muir that I am fancying… nor shall I cast on for something hideously complicated in the CookieA line of footwear… I won’t. I WON’T ! Ta da! That’s a whole heap of self-discipline that you are looking at, and an even larger pile of frustration and boredom. 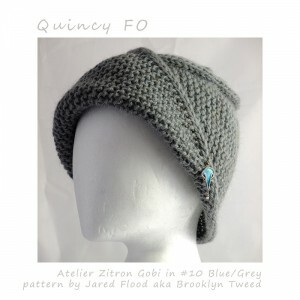 Well under two balls of Gobi –Â plus 3 hours of work, a pair of 6.5mm needles and a set of 6mm DPNs and you too could have one of these fab hats. I suspect that I have a half ball left, so three balls would get you two hats… but as my scales are U/S, I cannot really confirm this. The hat is generously sized and could be skimped in order to ensure two hats from 150g, to no great detriment. Full details on Friday in a proper FO post, but I cast this hat on when the yarn arrived on Saturday morning. A couple of hours knitting saw the body finished (a simple strip of garter stitch, with i-cord edges) and an extra hour on Sunday in front of the iplayer with Oklahoma saw the crown added and the hat completed. It is a smasher and I definitely need more Quincies in my life. Yes, I know that I am supposed to be dedicating my knitting time to UFOs, but I felt in need of both a reward and some time off from all that herringbone rib – three hours wasn’t much out of my life to gain some refreshment for my knitting soul, was it? Thanks for the Gobi link (well I’m not sure my bank balance thanks you…), and I have also done that pattern and found it torture. I caved and did just plain rib on the foot! The socks make progress, herringbone rib and all. Sigh.